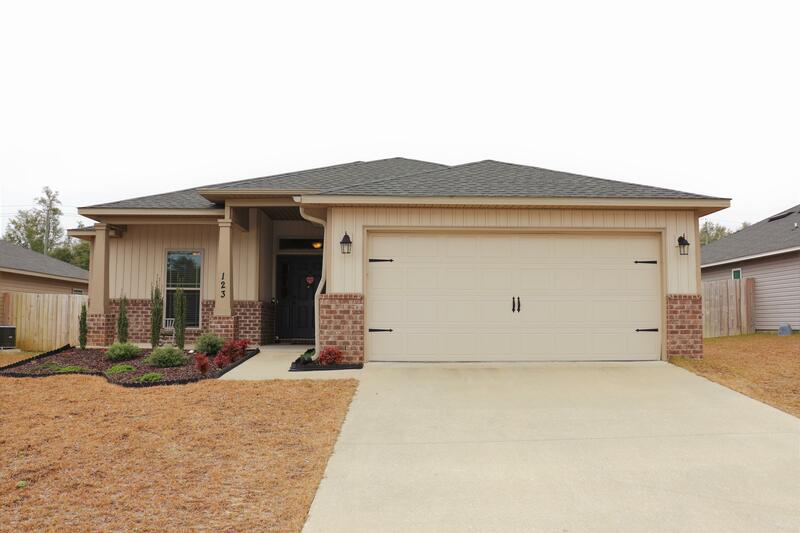 Gorgeous 5 bedroom home built in 2016 located in South Crestview! This home is truly an open floor plan, with cathedral ceilings and recessed lighting in large Family Room and Kitchen/Dining Area. Beautiful flooring! Tons of storage and workspace in the spacious Kitchen, featuring granite countertops, island, and large walk-in Pantry. Master Bedroom is conveniently located off of Family/Dining Room, with Master Bath offering 2 walk-in closets, garden tub, large separate shower and dual vanities. 3 additional bedrooms are located in hallway, while 5th bedroom is situated in front of home off of Foyer. Enjoy the recent cool nights under the covered back patio, with lots of room for outdoor furniture and grill! Back yard has privacy fence with room to roam! Move in ready and well maintained!